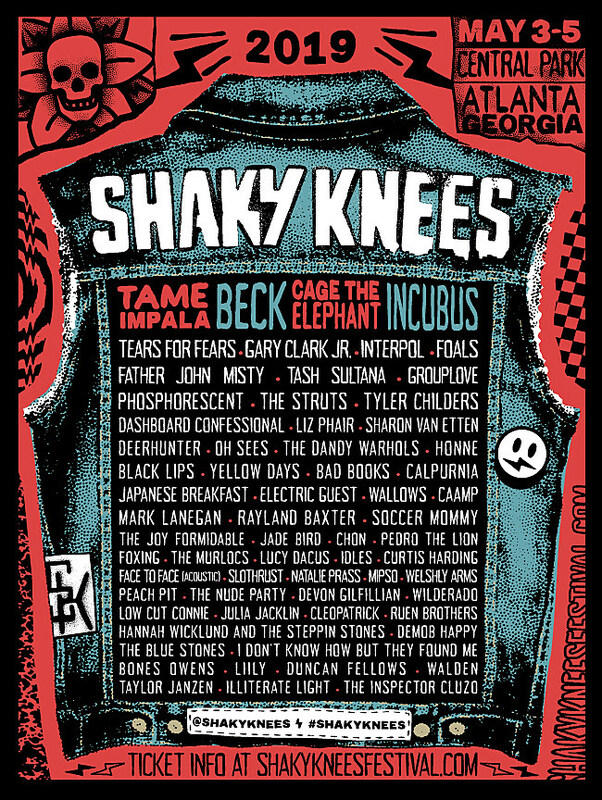 Shaky Knees Festival returns to Atlanta, GA’s Central Park on May 3-5, 2019. Tame Impala, Beck, Cage the Elephant, and Incubus headline, and the lineup also includes Tears for Fears, Gary Clark Jr., Interpol, Foals, Father John Misty, Tyler Childers, Phosphorescent, Dashboard Confessional, Liz Phair, Sharon Van Etten, Deerhunter, Oh Sees, The Dandy Warhols, Black Lips, Bad Books (Kevin Devine and members of Manchester Orchestra), Japanese Breakfast, Mark Lanegan, Rayland Baxter, Soccer Mommy, Pedro the Lion, Foxing, Lucy Dacus, IDLES, Curtis Harding, Face to Face (acoustic) Natalie Prass, Julia Jacklin, and more. See the full lineup on the poster above. Tickets to Shaky Knees go on sale Wednesday (11/14) at noon, and general, VIP, and platinum three-day options are available.